It's a quintessential spice in curry, a relative of ginger and one of the healthiest ways to add flavor -- and color! -- to a home-cooked meal. Turmeric has been used to relieve everything from liver problems to depression to ringworm in folk medicine, but, like many alternative therapies, there's not always much research to back up the ancient wisdom. But that doesn't mean turmeric's powers are to be discredited altogether. Here, a look at what we do know about this powerful seasoning. In a small 1989 study, supplements made from the turmeric plant were found to be more effective at curbing heartburn and indigestion symptoms than a placebo, possibly because of the plant's known powers to fight inflammation, Everyday Health reported. Curcumin, the compound in turmeric responsible for that bright hue, is behind a whole host of the health benefits attributed to the spice. A 2012 study examined one perk of curcumin in particular: the ability of the extract to prevent heart attacks among bypass patients. The study followed 121 patients who had bypass surgery between 2009 and 2011. Three days before surgery through five days after, half of the patients took curcumin capsules, while the other half took placebo pills. During their post-bypass hospital stays, more people in the placebo group experienced a heart attack (30 percent) compared with those in the curcumin group (13 percent), Reuters reported. While not a substitute for medication, the researchers pointed out, the antioxidant and anti-inflammatory properties of curcumin may contribute to as much as a 65 percent lower chance of heart attack among bypass patients. ... And even fight cancer. 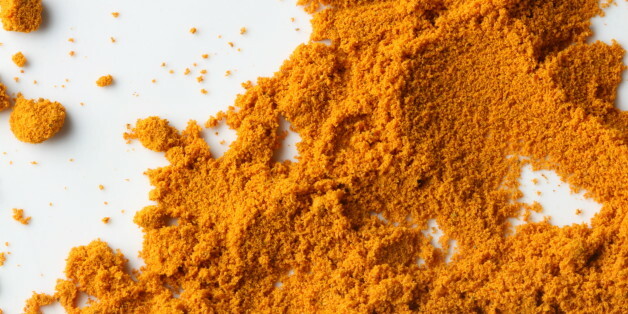 While studies in humans are still in very early stages, lab and animal studies have shown promising effects of curcumin in the fight against cancer. Curcumin "interferes with several important molecular pathways involved in cancer development, growth and spread," according to the American Cancer Society, even killing cancer cells in the lab setting and shrinking tumors and boosting the effects of chemotherapy in animals. Aromatic turmerone or ar-turmerone is not as well-studied as curcumin, but it also likely plays a part in the turmeric puzzle. In a recent study, researchers found ar-turmerone promotes repair to stems cells in the brain. The study examined the effects of the compound in rats on a type of stem cell that is also found in adult brains. These stem cells are involved in recovery from neurodegenerative diseases like stroke and Alzheimer's. The compound could potentially be used in the treatment of these diseases in the future, the findings suggest. The new study builds upon a larger body of research suggesting curcumin may improve overall memory in Alzheimer's patients, due to a wide range of possible pathways, according to a 2008 review. Curcumin has been definitively deemed to carry anti-inflammatory powers, although its exact pathways still aren't completely understood. However, that knowledge has led to a number of studies examining the benefits of turmeric to people with joint pain or arthritis. One of the most promising found that turmeric extract supplements worked just as well as ibuprofen in patients with knee osteoarthritis. The FDA doesn't regulate dietary supplements the same way it regulates food or conventional medication, so not every supplement is created equal. Also, certain supplements, including those made from turmeric, can interact with other medications. Turmeric may slow blood clotting, for example, so people taking drugs with the same effect, like anticoagulants, should be cautious about taking turmeric supplements, according to the National Institutes of Health. And of course, it's always a good idea to talk to your doctor before starting any kind of supplements.